Apple has rolled out a new iPad and classroom software aimed at grabbing more of the education market, but the company has not cut the price of its entry-level tablet despite schools flocking to laptops costing a third less. Apple is looking to reassert dominance in US schools, where inexpensive laptops running software from Alphabet's Google and Microsoft now top iPad by sales, offering a cheap way to get to cloud-based productivity tools. The new iPad has a more powerful computing chip and an extensive set of new, free software for teachers to manage students and schoolwork. But the unchanged starting price of US$299 for students and US$329 for the general public, without a keyboard or case, compares with less than US$200 for some Windows and Google Chrome models. Apple shares were down 1.4 per cent to US$170.26 after the event, slightly better than the NASDAQ Composite, which was down 1.6 per cent in midday trading. Some analysts had believed Apple might cut prices, but the company stuck with its more traditional approach of packing more features into a device. Despite the new software, Apple faces a tough battle in the educational market given the popularity of Google and Microsoft's productivity suites, said Carolina Milanesi of Creative Strategies. Google's G Suite fuelled Chromebook sales because it was seen as easy to use to manage assignments. "Most teachers don't look past G Suite for education," she said. Apple, as part of its response, on Tuesday announced improvements in its iWork suite at an event in Chicago, where school bells and announcements over a public address system directed press and more than 300 teachers into an auditorium at Lane Tech College Prep High School. The event came during a spring buying season when many schools are making purchasing decisions for the upcoming school year. "We've been at this for 40 years and we care deeply about education," Apple chief executive Tim Cook said at the event. 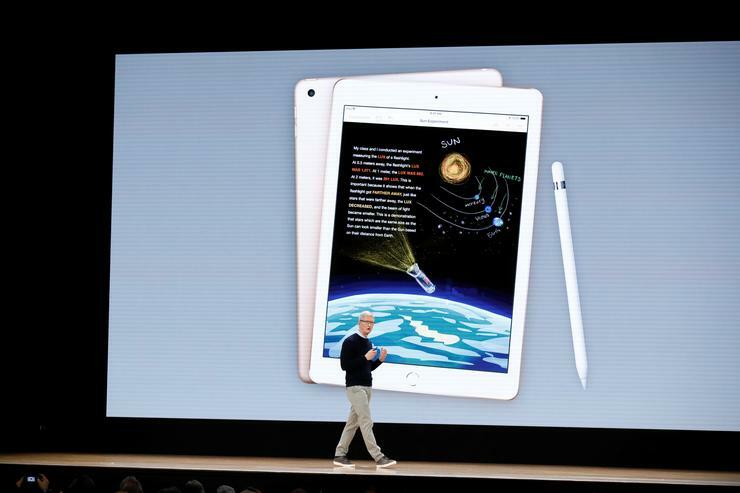 Apple executives said the new iPad works with its pencil accessory and features an upgraded A10 Fusion chip, the same CPU that powers the iPhone 7. It is available immediately. The Apple Pencil remains priced at US$99 for the public and $89 for schools, though Lenovo will release a device called Crayon for $49, the first third-party stylus to work with the iPad. Apple made up just 17 per cent of the K-12 US educational market in the third quarter, according to data from Futuresource Consulting. Meanwhile 60 percent of mobile computing shipments to schools ran Google's Chrome and 22 per cent had Windows. Chromebooks sold by Dell Technologies cost as little as US$189. Microsoft last year introduced an education-focused laptop from Lenovo Group running Windows 10 S for a similar price. Acer announced a tablet that runs Chrome OS for US$329 on Monday that comes with a built-in stylus. Apple in recent years made changes to its operating system so that more than one student can log into an iPad, and to its software to let teachers better manage students. On Tuesday it updated iWork - which includes word processing, spreadsheet and presentation software - to allow students to take handwritten notes more easily, along with adding more free storage on its iCloud service. Apple also released a new app called Schoolwork to help teachers create assignments and track student progress. Google has a similar app for managing student profiles, but analysts highlighted Apple's Schoolwork app as unique in helping teachers manage assignments and progress. The previously iPad-focused Classroom teacher administration app would start working on Mac computers in June, Apple said. In the fall Apple will roll out "Everyone Can Create" lessons on video, photography, music, and drawing, joining existing "Everyone Can Code" guides for computer programming skills. The new courses highlight features that some low-priced laptops do not have, such as a camera and microphone. "If you look at it as a Chromebook competitor, it's expensive. But if you look at it and say, I can do music with GarageBand, I can take pictures or use it as a video camera and now I can do (augmented reality) ... it appeals to teachers and schools that want to push the envelope on education," Milanesi said. Sales of iPads made up just 8.3 per cent of Apple's US$229.2 billion total revenue last year, compared with the nearly 62 per cent of sales generated by iPhones.